This is the best and biggest bang for your buck, when planning winter golf packages. As I mentioned earlier, the lodging (Villa's, Condo's and Homes) are inexpensive. Here are a couple of my recommendations for lodging choices - Magical Memories, followed by Grand Beach Resort, Sheraton Vistana Villages, and Sheraton Vistana Resort. Finally the high end resorts with Villa's and lodging on site - Reunion Resort (villa's and homes), Grand Cypress (villa's), Champions Gate (hotel rooms and villa's) and Orange County National (hotel rooms). Reunion Resort is the only one of these resorts that require you to stay on property in order to play there. Disney - 72 holes. Palm/Magnolia (PGA Tour event), out of same club house. Lake Buena Vista and Osprey Ridge have their own clubhouse. 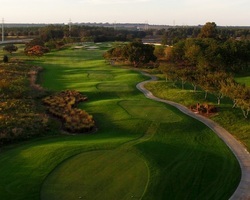 Orange Lake Resort - 36 holes, less expensive (Legends course designed by Arnold Palmer). To keep from having too long of a post, I will limit each one to a specific area in Florida. In the meantime, please feel free to email me - glen@golfzoo.com or call me with any questions or help - 888.333.6103.